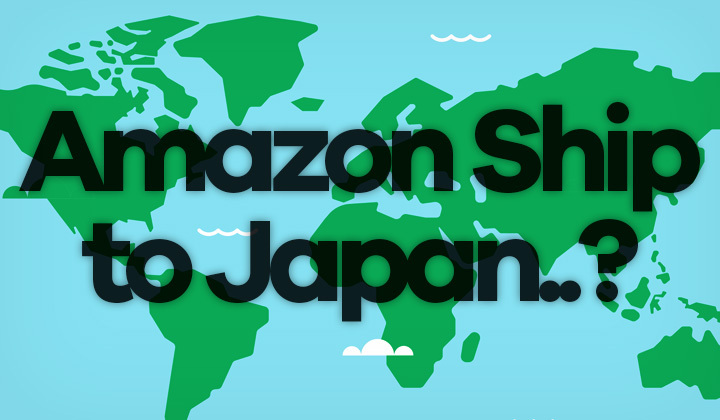 With these tips you can have the US Amazon send items to Japan with low-cost, international shipping & delivery. Do time saving online shopping in 2019. I noticed that a lot of people online were asking “do amazon deliver to Japan?”. I shop at Amazon from Japan, and decided to clear up things in this post. How does Amazon ship stuff to Japan easily? First and foremost — check the Japanese version of Amazon. Japan has their own version of the Amazon store, and it’s available in English (click on the globe icon that says ‘JP’ at the top right to change the language to ‘EN’). Not only is it super well stocked, but many US Amazon sellers are directly selling through the site. So it’s the easiest way to find products that are shipped to Japan. You can even use your old US Amazon account to login (with this link). 2. Can US Amazon send items with international shipping? If what you are looking for is not available on the Japanese site, you can find plenty items on the main Amazon.com store in the USA that can be shipped internationally. If you are located outside of Japan, click on the top left corner where it says “Deliver to USA” or whatever country you are in. Select “Japan” under where it says “Ship outside the US”. Browse through products and it will say “this item ships to Japan” when order is possible. Or it says “this item does not ship to Japan. ” if not. However, most Amazon Global products do. The cost of shipping is will be more expensive than online shopping directly from the Japanese Amazon website. Depending on the item, slower and cheaper sending methods will be available. Or you can use courier services to save time. Please note, that if a product is “fulfilled by Amazon” or an “Amazon prime” item, they are more likely to support sending to Japan, and fast courier shipping. 3. Ordering items available with US delivery only? If what you are looking for is only available to order for customers with a US based address, your last option is to use a package forwarding service. I recommend USGoBuy because they are one of the most reliable ones, and provide discounted rates for shipping. You can group orders together, etc. If you don’t have an account with them, I suggest using this link to register which gives you a discount coupon for your first purchase from Amazon. Registration and your own address in the United States, Oregon is free. And they can store your packages in their Oregon warehouse for 60 days free. This address enables you to do sales tax free online shopping in the US, saving you in costs. Which locations in Japan can you ship items to from Amazon? Anywhere, by using any of the methods. Including Japanese islands; Kyushu (九州), Hokkaido (北海道), Honshu (本州), Shikoku (四国) & Okinawa (沖縄). As well as all of the 47 Japanese prefectures; Gunma (群馬), Osaka (大阪), Nagasaki (長崎), Tokushima (徳島), Kyoto (京都), Kagawa (香川), Okinawa (沖縄), Tokyo (東京), Okayama (岡山), Chiba (千葉), Hiroshima (広島), Ibaraki (茨城), Yamanashi (山梨), Niigata (新潟), Miyagi (宮城), Iwate (岩手), Shizuoka (静岡), Fukui (福井), Saitama (埼玉), Oita (大分), Saga (佐賀), Fukuoka (福岡), Kagoshima (鹿児島), Kochi (高知), Nara (奈良), Ehime (愛媛), Nagano (長野), Toyama (富山), Aichi (愛知), Mie (三重), Kumamoto (熊本), Shimane (島根), Hokkaido (北海道), Kanagawa (神奈川), Hyogo (兵庫), Yamagata (山形), Tochigi (栃木), Gifu (岐阜), Tottori (鳥取), Fukushima (福島), Wakayama (和歌山), Akita (秋田), Aomori (青森), Ishikawa (石川), Yamaguchi (山口), Miyazaki (宮崎) and Shiga (滋賀). And Japanese cities; Osaka (大阪市), Fukuoka (福岡市), Sapporo (札幌市), Saitama (さいたま市), Sendai (仙台市), Chiba (千葉市), Niigata (新潟市), Nagoya (名古屋市), Kyoto (京都市), Yokohama (横浜市), Nerima (練馬区), Hamamatsu (浜松市), Kawasaki (川崎市), Shizuoka (静岡市), Sakai (堺市), Hiroshima (広島市), Sagamihara (相模原市), Okayama (岡山市), Kobe (神戸市), Kitakyushu (北九州市), Tokyo ( 東京), Setagaya (世田谷区) and more! Someone once asked me if you can get free shipping. This is not possible. Any questions about Amazon shipping and deliveries to Japan? I’m happy to share my knowledge on online shopping in the country. So great you could visit my site. Please, share the post if you can! Some of these guides, reviews and other posts contain affiliate links, but not all of them of course. This won’t change pricing of purchased items, and simply supports my efforts writing the blog and producing useful content based on my experience. This website, kachi.jp is a participant in the Amazon Associates Program, an affiliate advertising program designed to provide a means for sites to earn advertising fees by advertising and linking to amazon.co.jp & amazon.com. Warmest regards & greets from Japan, Tim.